Do you feel like there is always ‘something else’ that you are striving for? Are you carrying around something from your past? In today’s podcast we discuss how to ‘live in the space between’ our past and future. And what we may be missing when we are not living in the present. Join me and listen, reflect and be inspired, as we practice ‘Living as we Intend’ together! How to Subscribe, Listen and please Review!! iPhone: Click here to subscribe to the show on iTunes. 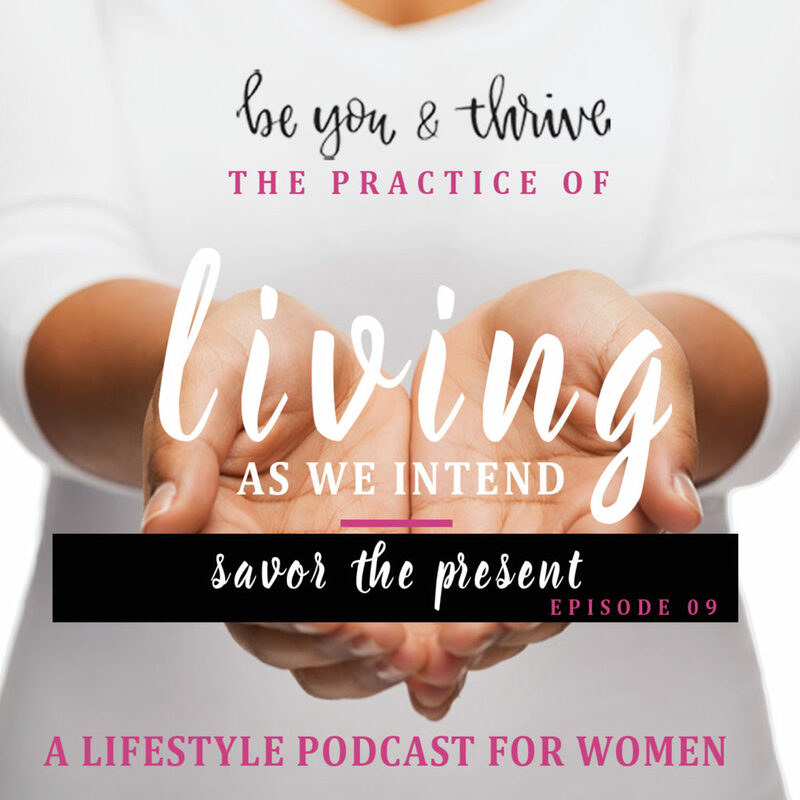 (or search ‘The Practice of Living as we Intend’ under Podcasts, in your iTunes store app). Listen to Episode 09 below! (1:17) “Embrace your life! Accept it—Just as it is, right now. So that those moments of happiness that you’re waiting for don’t pass you by.” As I read the responses that were shared within that topic’s feed, I resonated with many of your thoughts and stories. (So much so, that I got permission from a few to share their insight). (3:13) And what I find ironic is that there are two different ‘reasons’ for not accepting or embracing life as it is right now. (4:30) I think we’ve proven that this ‘space in between’ is often difficult to settle in to. It’s transitional no matter what our circumstance. (6:14) But because these things have already happened or are not going to happen, they are not a part of our ‘present moment.’ And our focus should be practicing how to move forward, while allowing ourselves to grow from the experience. (8:06) During these difficult transitional seasons of life, I like to frame it with a word. And the word I like to use is ‘sit’. Because when we sit, we are still, and we’re not moving anymore. Normally when you’re sitting, it’s a restful time, right? (10:00) I think this idea of looking ahead can get sticky in regards to it’s meaning. When I think about the quote I’ve referred to, ‘Honor the space between the no longer and the not yet, ‘ I don’t think it has anything to do with laying our dreams down or foregoing our hopes and desires for our future. (11:11) In these instances, I don’t know exactly what we are looking for. I think it’s very unique to each of us. Perhaps it’s a feeling that we are lacking or missing out on what we haven’t yet experienced. Maybe our focus is too much on what others are accomplishing and we feel the need to catch up. (12:38) Let’s not miss the gifts that can be found within each of our present moments. And let’s practice becoming more aware that they are there. Gifts may come in the form of people who deposit wisdom or love into your life, they may offer knowledge for your next steps. (13:41) I was inquisitive about how ‘honoring’ was defined and so I did some research: And words like celebrate, confidence, trust and greatness came up. (15:09) It caused me to stop and think as I was considering what to teach about in this week’s podcast: Perhaps this is how we should think about our present moment. Perhaps our present moment (that space in between our past and our future) is just too beautiful and meaningful to define. And perhaps we should live in it as if we want to savor it forever. This was beautiful, as usual, D! I wrote an article for Taylor Magazine about living in the now. This podcast reminds me of that article. People who are always looking to the next big thing end up missing out on life. On living their life. And how brilliant is that little girl?? Who is the teacher there? Just beautiful!! This podcast is resonating sooo much with me, Dannielle. Lots of food for thought. How much do you value your passion?